It’s Half Term and the kids are driving me potty already! Can the Tarot suggest a way for this hassled mum to cope? Kids are enough to turn your hair white, wear you out, drive you to drink and goodness what else! But they’re also incredible beings, proper little people and raising them is hard work. There’s the teaching them of manners, politeness, respect. There’s also the teaching of treating others as you’d like to be treated, helping around the house, how to fend for yourselves. And it doesn’t all get taught in one day. It’s a constant reminder, education. Not counting the school education, the answering of the “but why?” question countless times, numbers, walking, talking. It was suggested to me that the school system “breaks” a child and teaches any child bad skills, as children learn bad habits from their peers. We all learn bad habits and to find out what works for us takes experience. 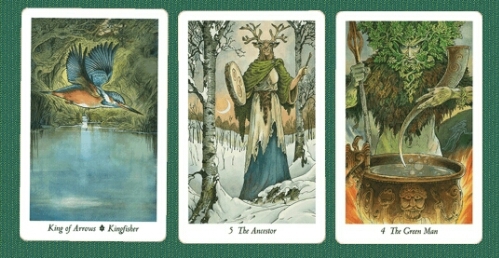 The cards above suggest that being firm and direct is the best way to go (Kingfisher), but relying on what has gone before (Ancestor) isn’t going to help. What will help is using the fatherly presence, giving the kids parameters and letting them operate in that (Green Man), without the controlling element that may have gone before (back to the Ancestor). I used the Wildwood Tarot for this blog post and I have a few parting thoughts. What promises have you made to your children or to others this week? Are you conforming to the ideas and expectations of others, or out-dated “rules” on how things should be done? Hi Louise, I must still be a kid at heart because I continue to ask But Why and whatever the answer my next question is often still Why. So far this week I have made no promise but the week is still young ! I do enjoy reading your blog too, Ellen! And yes, from with some safe constraints.